Ordinary Time are the periods of time in the liturgical calendar following Easter and Pentecost, outside of the narrative of the life of Christ. 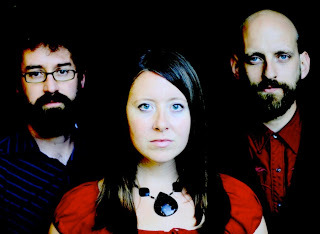 Ordinary Time is an independent folk acoustic trio rooted in the Christian tradition. Comprised of Ben Keyes (guitar, piano, mandolin), Peter La Grand (guitar, banjo, dobro), and Jill McFadden (guitar, violin), Ordinary Time presents extraordinarily rich vocal harmonies, skillful instrumentation, and thought-provoking lyrics. The band’s oeuvre seamlessly weaves the hymns of generations past with their own new songs– often indistinguishably– producing a sound that ranges from bluegrass-tinged Americana to sacred hard hymn arrangements. The band has released three records and tours semi-annually. and you won’t always say where. The idea of the burdens of Christ being light, but his blessings heavy is so powerful to me. And the very reality of the weight of the Lord’s supper is so strong. It is a blessing, a means of grace, an actuality, the very real presence of Christ, and to receive it is to follow Christ wherever that may be. And if that is not a scary thought, than perhaps we don’t understand it. It may mean scorn, ridicule, social suicide, or even physical torment or death. It certainly means the constant process of sanctification, the burning away of impurities, the putting to death of the old man. Such are the blessings of Christ. It may be worth it, but it’s still heavy. I love vinaigrettes. I love that there are so many different kinds, that they are never plain, and that they tend to be very robust and flavorful. But mostly I think that they are fun to watch when you mix them together, because simply sitting in a shared space, never being shaken up, they separate out. But shaking them up is a very different thing indeed. Julie and I have decided to embark on a new journey of digital journaling for the benefit of those who know and love us. And those who do know us know how very different and complementary the two of us are. We both recently took the DISC test, and it turns out we really are basically diametric opposites in every category. I thank God for that. This will be an interesting intersection of two very different personalities types who have joined each other’s stories, and here reflect that concoction. So we are like a vinaigrette. Neither oil nor vinegar are very fun to drink on their own, but together they make a make a robust, flavorful, and beautiful marriage. Art lost its basic creative drive the moment it was separated from worship. It severed an umbilical cord and now lives its own sterile life, generating and degenerating itself. In former days the artist remained unknown and his work was to the glory of God.